CreativEase is a video effects plugin for Windows, including Windows 8 and 10. Sorry, we have no Mac versions currently, but may soon! 1. From the Effects window (Video Effects > Pixelan folder) of Premiere Pro, drag and drop a CreativEase effect onto a clip. CreativEase will appear in the Effect Controls palette of Premiere. 2. In the Effect Controls palette, click the Setup button to the right of the CreativEase name. The CreativEase interface will then appear. 3. Choose a saved setting or presets to quickly form an effect (see how in the next section below). Or adjust the effect's controls manually as desired. Then click the green "check-mark" button at the bottom right of the CreativEase window. You're done! 1. From the Edit panel (Effects Section) of Premiere Elements 10, scroll down to the Pixelan listing and drag and drop a CreativEase effect onto a clip. CreativEase will appear in the Effect Controls palette. 2. Click the small Edit Effects button at the bottom of the Edit panel. To the far right of the CreativEase effect listing that will appear in the Edit panel, click the small Setup button. 1. From the Effects tab at the bottom of Premiere Elements 11, choose Pixelan in the tab's top menu. Then drag-and-drop a CreativEase effect onto a clip. 2. In the Applied Effects panel of Premiere Elements 11, click the Setup button to the right of the CreativEase name. The CreativEase interface will then appear. Apply CreativEase identically to other After Effects plugins (built-in or third-party). Many animation presets are also included per plugin to instantly apply cool effects. 1. Drag and drop a CreativEase effect (abbreviated as "CE ..." in the Effects list of Vegas) from the Video FX (or Plug-In Manager) window/pane in Vegas onto any event in your Vegas timeline. Or, click the Event FX button on an event’s icon in the Vegas timeline, then choose CreativEase in the Plug-In Chooser window. 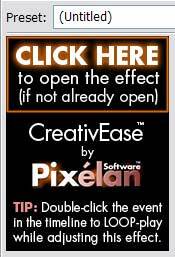 If the CreativEase main window is not visible, click the CLICK HERE button in the Event FX window (shown at right). 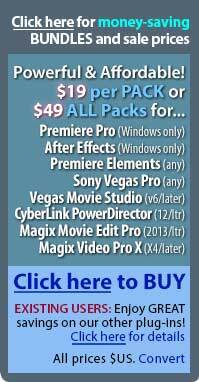 Note that only a few Vegas presets are provided for each CreativEase video effects plugin. That is because CreativEase has hundreds of built-in presets which are far more powerful and are all accessed from WITHIN the CreativEase interface. 2. Choose a saved setting or presets to quickly form an effect (see how in the next section below). Or adjust the effect's controls manually as desired. Then click the green "check-mark" button at the bottom right of the CreativEase window. You're done! IMPORTANT: To preview in Sony Vegas while making effect adjustments, click in your Sony Vegas timeline within the CreativEase event you are adjusting. Or double-click the event to loop play it real-time while making effect adjustments (shown below) — highly recommended and very cool! 1. In the FX (Effects Room) tab of PowerDirector, choose Pixelan, then drag-and-drop a CreativEase effect onto a clip in the PowerDirector timeline (or onto the Fx track). 2. 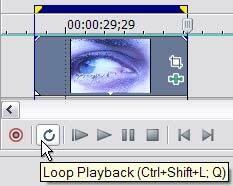 Click the Effect button above the PowerDirector timeline (if the CreativEase effect is applied on a clip) or click the Modify button (if the CreativEase effect is in the Fx track). Then click the Stand-alone Effect button to open the CreativEase main window. 1. In the Effects tab, choose Extra effects > Plug-ins, then drag-and-drop a CreativEase effect onto a clip in the timeline. The CreativEase main window will then appear. In CreativEase, choose from a HUGE range of pre-made professional effects per video effects plugin (see below). Save and organize your own effects/favorites easily, too. Click this button in a CreativEase effect window to select a saved setting. Several subfolders are included, organized by style. Single-click any saved setting to quickly preview and compare it with others. Double-click your final choice. Click a light-bulb button to choose a preset, instantly configuring A SECTION of CreativEase controls into a cool look. Even do it while previewing. With a few clicks, easily combine presets into THOUSANDS of compelling effects! An industry-unique feature! Note: The After Effects version uses After Effect's built-in presets menu instead of the above. For step-by-step tutorials and visual help, please see the terrific built-in help system in CreativEase. To access it, click the round ? button (shown above) in the lower black bar area of any CreativEase window. Or click the ? button in the top right corner of the window (or tap the F1 key), then click any control you want to learn about. Or view the entire help system online here. To set a CreativEase control to a new CONSTANT value, you do NOT need keyframes. Just drag the control's slider or enter a new value in its text box. To VARY a control's value LINEARLY during an effect, use the simple technique below. The below process works for any control that is keyframable (has a round keyframe button to the left of the control). 1. Go to the clip's FIRST frame. Drag the CreativEase effect's preview scrub control all the way to the left, as shown below. Other easy ways to do this are clicking the First Frame button under the preview, or entering "0:00" in the Current Time box to the left of the preview buttons. NOTE: In the Sony Vegas Pro or Vegas Movie Studio version, instead of the above (which are not available since Vegas' real-time built-in preview window is used), click the gray Keyframes button to open the Keyframes window (shown below). Then drag the blue vertical frame marker all the way left to the clip's first frame, as shown below. This technique also works in all other versions of CreativEase. 2. Set a value for the effect's FIRST frame. In the example below, we have set the Pre-blur value of the PosterWise plugin to 15 by dragging its slider. 3. Click the round keyframe button to the left of the control. This turns on keyframing for that control (as indicated by the button's light turning on) and sets a keyframe at the first frame to the value (in this example, 15). The effect will therefore start with that value. 5. Change the keyframed control's value by dragging its slider or entering a new value in the control's text box. For example, say we've increased Pre-blur to 25 at the last frame of the effect. 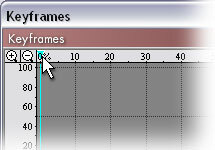 Between first and last frames, therefore, Pre-blur will smoothly increase linearly between 15 and 25. For example, the middle frame during the effect will automatically have a Pre-blur value of 20. To set different values for other frames during the effect, repeat Steps 4-5 for any other frames. That's all! A very simple but cool tip: By applying a CreativEase effect to a clip more than once, even more is creatively possible. Each pass can be optimized to a particular aspect of the desired look. Or by using the spice files and/or Mixer to target the effect into certain clip areas, you can repeat that to cumulatively target the effect to a wider range of areas in the image. Experiment! CleanCrop and BlurPro are a very powerful duo for enhancing the look of your OTHER video effects (not just other CreativEase video effects). Apply CleanCrop first to ensure that noise or other dark/stray pixels around a clip's frame edge will not muddy or magnify when applying ANY distortion and blur effects. Apply BlurPro first before other artistic or color effects to get purer effect results. Click the above links to see image examples. CreativEase's terrific help system should answer most questions. If you still need help, however, please email us via our tech support page. We'll promptly answer questions or suggest a tip, whether you are an existing CreativEase user or just trying the demo. And yes, email is best instead of calling us. We devote lots of resources for 16+ hours/day to answer such emails promptly.